For a dear friend on the anniversary of our meeting. As poetry, it's pretty terrible – but when have I ever let that stop me? (grin) Anyway, a wonderful Solstice to you all. May you survive and thrive in these ever-so-interesting times. Thank you. 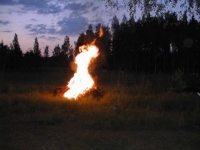 Have a magical Midsummer, too!